Once there was a young boy who lived in the country. Like with all young boys who live in the county, there were always chores he needed to do. It just so happened that this boy lived on a farm with rocky soil, and one day his father told him to go pick up rocks. Being nine years old, the boy pretty well knew that this impossible task would be the end of him. First, the boy pulled on his boots, because that’s what you wear when you do chores on the farm. Then he went out to the field. When he got there, the boy stopped dead in his tracks. He had forgotten just how many rocks there were. Big rocks, little rocks, all different shapes and sizes of rocks were on the ground all around him. He knew instantly that he’d been right. This chore would be the end of him. But this boy was a fighter. He wasn’t about to give up. So, he made a plan. You see, the details of his chore were that he had to fill the back of a wagon with rocks. Once that wagon was full, he was done for the day. He figured that the best thing to do would be to find the altogether biggest rocks he could, and put those in the wagon. With just a few of those big rocks in, he’d be done, free and clear. The little boy looked around to find his first big rock. He was in luck. It was right at his feet. He reached down, grabbed the rock in both strong hands, and pulled. Nothing happened. Undeterred, the boy planted his feet, put the look on his face he’d seen the men use to pick up heavy things, and pulled again. Nothing. The boy realized that the rock was just too heavy. He scouted out another big rock and went over to it. He put the right look back on his face, bent his knees (because his grandfather always said you have to lift with your knees) and gave that rock the mightiest tug the farm had ever seen. Nothing. Now this boy, he didn’t know the meaning of the word quit. For the next hour, he went from big rock to big rock, tugging and pulling and face-making and bending his knees. But the result was always the same. Nothing. Nothing. Nothing. Finally, the unending setbacks were more than the boy could take. He looked around, just to make sure no one was watching him. Then he collapsed on the ground next to the wagon, whose emptiness only added to his misery, and seriously thought about crying. It just so happened that the boy’s mother, a very wise woman, had been watching the boy the whole time. She was sad for her son, because he had forgotten the advice she had given him as he put on his boots to head out to the field. The boy’s mother went to him, and asked him what was wrong. The boy did as his mother said, and started finding small rocks to pick up. With each rock he put in the wagon he knew that he was one rock closer to being done. Seeing his efforts add up gave him strength, and he never once got tired. In less than an hour, the wagon was full of small rocks, and he was done. The big rocks were left in the field, and some small rocks too. But his job never was to clear the field of all the rocks, big or small. His job was to fill the wagon. Sometimes, when people study for the LSAT, they’re like the boy when he first goes out into the field to pick up rocks. They’re overwhelmed by the task and the size of the field. They have the wrong perspective, thinking that their job is to clear the field of rocks rather than just filling up the wagon. They approach their study by going after only the big rocks, hoping to knock out the chore quickly, rather than making immediate and sustained progress by picking up the small rocks that are all around them. 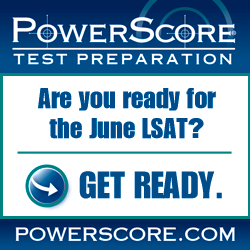 Your job on the LSAT is not to lift the huge rocks. It’s not to be perfect or finish faster than everyone else. Don’t be overwhelmed by a task that wasn’t even yours to begin with. Your job is to make the best progress you can by identifying and correcting the small holes in your knowledge or deficiencies in your process. Those small errors are things you can fix quickly, marking your progress as you go. As you pile victory on top of victory, small though they may be, you’ll energize yourself and gain confidence. Before you know it, you’ll have filled the wagon and will be that much closer to your goal. Photo: “Treasure” courtesy of Dennis Wong.